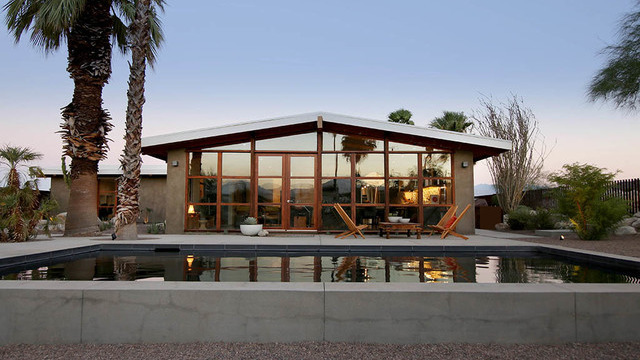 Los Angeles architect Duane Smith was looking to buy a Palm Springs getaway he could turn into a rental. What he and husband Stefane Barbeau got instead was a major remodeling project and a home that is now their full-time residence. “We fell so in love with the area that when we were done, we decided to move there full time,” Smith says. After gutting the interior and doubling the square footage, Smith and Barbeau today enjoy unobstructed views of the San Jacinto Mountains from their remodeled mid-century jewel. An added bonus: Their home will be part of the signature tour at Modernism Week 2017, Palm Springs’ celebration of midcentury architecture and design. At first, Smith considered empty lots, finished condos and a few fixer-uppers. 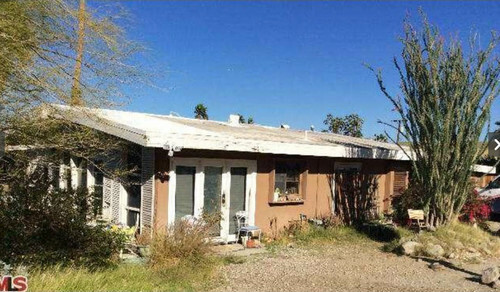 But when he saw the dumpy cottage in Palm Springs’ Chino Canyon area, he knew it was the one. With no knowledge of its history, Smith says he could tell the home had character. Though rough around the edges, it appeared that care went into its design, so he figured an architect must have been involved. He says the window detail and post-and-beam construction were reminiscent of a Cliff May rancho-style home. One telltale sign of an architect’s touch was the multipaneled wall of glass in the living room, Smith says, which indicated to him that the home was custom-built. It was one of the few features kept during the remodel, though the rotted wood frames had to be redone. Not an Experienced Architect? Consider This Before Investing in a Fixer Upper. done with a high-pressure air gun that blasts the surface to remove old paint and coating that would be difficult to do with sandpaper alone. Smith incorporated framed prints by street artists into the interior design, including this piece purchased at a gallery in the Venice neighborhood of Los Angeles. It combines images of Audrey Hepburn and Crouching Tiger, Hidden Dragon actress Zhang Ziyi. Two 1960s Danish chairs from the owners’ collection flank a small marble-topped end table from Jonathan Adler. A paper lantern atop the television console is from designer Isamu Noguchi, whose 1950s light sculptures were an iconic symbol of midcentury modern design. Renovation work was extensive. The rotted wood was repaired, the ceiling sandblasted and the interior walls removed. The original 1,100-square-foot structure had an illegal addition. 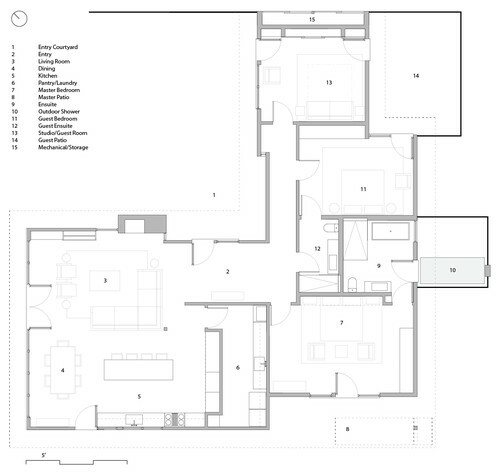 Smith turned what was a bedroom into an entry courtyard, shown in the floor plan as the crook in the L-shaped layout — a feature inspired by original Southwest ranch house design. A 15-foot-tall cactus dominates the new main-entry courtyard. The plant was growing on the lot but got in the way of construction during the renovation. It took four men using a pickup truck to drag the cactus to its current location. Handsome double doors serve as the home’s main entry. Concrete pavers were custom-poured using an acid wash for a smooth finish. The gravel is a fine Arizona river stone. 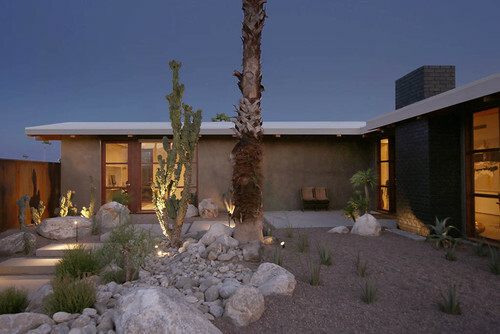 Smith notes that the color reflects the environment’s granite and complements the surrounding desert and mountains. The main challenge of the project, Smith says, was the massive repair work and the fact that it cost more to fix than it would have to tear it down and rebuild. The result was a faithful interpretation of midcentury architecture combined with of-the-moment design touches. Here, the redone wall of windows lets an abundance of light into the dining room, which is furnished with a custom-made dining table built by Smith. 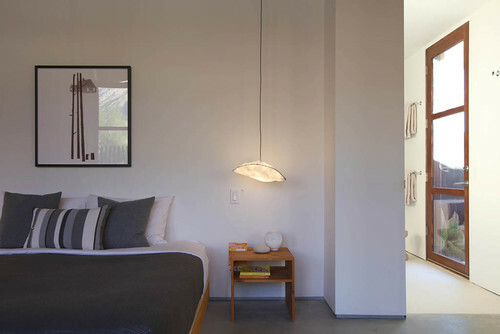 The Tyvek cloud pendant lamp above the table was designed by Smith and Barbeau, who were industrial designers with their own company and a brand called Vessel. The vintage industrial-style Pagholz stacking dining chairs, constructed of thin layers of wood veneer, are from Germany. The bunny sculpture was a Palm Springs flea market find. Original concrete floors throughout the house were recovered and polished. Spark Conversation by Decorating With Unique Lamps and Fixtures. A Los Angeles cartoon bear print hangs over a table with shelves designed by Smith. Cabinets surrounding the refrigerator have custom-made fronts of wood-grain textured laminate. Smith installed the fronts onto Ikea base cabinets. Quartz tops the 4-by-10-foot custom-made steel island. To keep the room from feeling closed off, Smith avoided putting cabinets or shelving into the island, which can seat 12. Smith expanded the original space, transforming it into a chef’s kitchen. 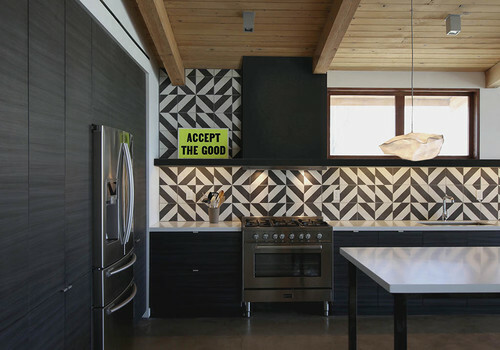 The backsplash’s handmade cement tiles were laid in a striking geometric pattern. Smith says that he initially thought the tiles were “a bit of a risky thing” and that they were afraid of going too bold. He first saw them at a barbecue restaurant in Los Angeles’ Grand Central Market, so he dug around until he found the Nicaraguan tiles through a Los Angeles company. “They last a lifetime and they’re perfect for a backsplash,” he says. The eye-level windows above the sink face the mountains. “We joke that it’s the best view we could wish for when doing dishes,” Smith says. A mix of midcentury and current-day modern furnishings occupy the master bedroom, including end tables from the owners’ friend Ben Durrell and a Tom Vac rocking chair by Ron Arad from Vitra. The master bedroom’s large doors open wide to a patio and the mountains just beyond. 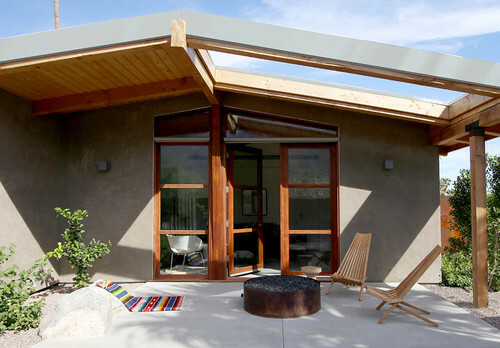 An open section of roof over the patio allows for mountain views from the master bedroom and provides ventilation for the firepit. 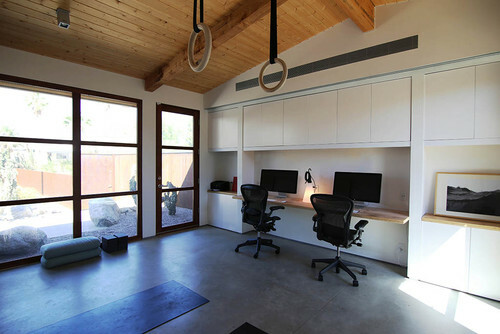 Smith and Barbeau work side by side in their multifunctional office-yoga room, where Barbeau also conducts yoga classes. A door leads to a private patio. Where the pool is now was once an empty area of dirt and a few plants. The pool is made of cast concrete and has a black gemstone finish, which appears as a teal color in the sun. “We wanted it to seem like the pool was carved out of concrete block,” Smith says. A paloverde tree against the rusted steel fence is part of the natural desert landscaping that was inspired by the owners’ love of nearby Joshua Tree National Park. The owners left the boulders, which are just the right height for sitting on or leaning against while lounging at the pool. Guests often pull up pillows, sit at the edge of the pool and lounge on the boulders — a fitting way to take in the natural beauty of the outdoors in Palm Springs. 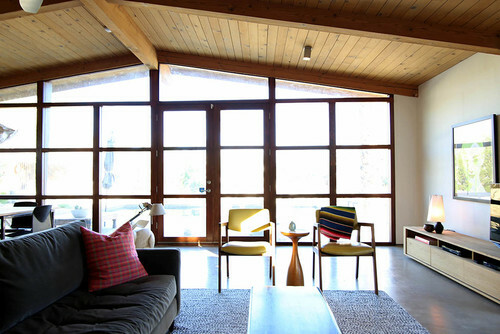 See Another Midcentury Home Restored in Ojai, California.